As seen on Oct. 3, Waverly Assisted Living is under construction at 2853 Salem Ave. S.E. 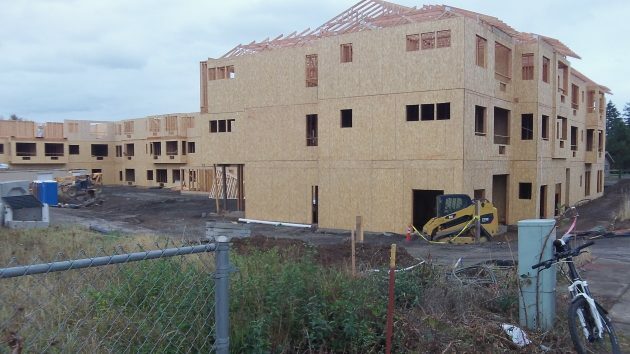 Looking at the massive construction project on Albany’s Southeast Salem Avenue, your first thought may be: “Wow, that’s a lot of wood.” In a matter of months the place known as Waverly Assisted Living will become home for up to 98 people who are getting up in years. After site work was done early in the year, the three-story, 73,000-square-foot complex has been under construction since July. The Albany building permit values it at nearly $11.8 million, and the city fees alone amounted to $443,700. When will the place be finished and ready for tenants to move in? “We don’t have an opening date yet,” said Keely Raff, the director of sales and marketing for Ridgeline Management Co. She spoke to me Monday from the company office in West Linn and said she expects to know more after a meeting at the end of October to review the status of the Albany project. They had been hoping for a completion date some time near the end of the year. The complex, at 2853 Salem Ave. S.E., will provide 24-hour care for people in 91 apartments. Seventy of the units are intended for “assisted living” and 21 for people needing “memory care.” The first floor will be mainly common areas, including exercise space and a coffee shop. The company, Raff told me, is getting calls every day from people asking about, the project. With the way our population is changing, there’s a growing need for accommodations of this type, and she notes that this one, on a major thoroughfare, is in a highly visible spot. As BabyBoomers age, pressure to build and operate these types of facilities will only grow. The stress on City budgets will weigh heavily on the future financial health of our fair city. That is why the Konopa-Kellum cadre, having been joined at the hip in spite of their mutual and obvious dislike of one another, joined in tandem to ban recreational marijuana sales in Albany. The duo seem to be more concerned about their “vision” than the future resilience of Albany. The City, with it’s metaphysical mayor casting the deciding vote, made the determination that Albany should forgo the tax benefits that flow from so-called “sin taxes” resulting from pot sales. The business-busting duet were never quite clear as to the logic of their vote. Now, the electorate of Albany must vote again on this job-creating, revenue-raising issue. Vote NO is the choice for Albany citizens who are weary of the Konopa-Kellum Cabal and their outsized influence on the lives of average people. Perhaps, with the additional tax revenues which will flow to the City if the ballot measure is defeated, it might just be that the City will be able to afford to keep up with the aging of our society. It might just be that more companies who cater to the elder will be tempted to open businesses in Albany because they’ll view our fair city as friendly to business. We can only hope that Albany’s electorate will see through the the Konopa-Kellum syndicate. Vote NO on ballot measure 22-156. Don’t let the government tread even more than they already are. Rich is every bit as passionate for his beliefs on this as I am for mine. I wouldn’t have it any other way. Mr. Kopczynski’s analysis seems spot-on. Stranger Bedfellows have existed in other venues, but we here in Albany are principally concerned when seemingly impossible couplings such as Konopa-Kellum occur. The disparate duo have aligned their agendas temporarily in order to deny the electorate their cannabis. Vote no on 22-156 and send a message to City Hall….we, the people, will not tolerate the Konopa-Kellum junta. Tre’ Mork, Albany Ward 3 candidate for council is the right person right now for seniors and housing assistance. Dump Kellum. Knoopa – Kellum cabal? Get a grip. Growth of senior housing causing financial stress on the city? No, that’s pretty silly. Those structures will add to the tax base and generate new revenue all around. The biggest impact from those seniors may be an increase in ambulance calls, but overall they will be pretty low demand on the services side. Unlikely they will be adding kids to the school rolls or making a lot of police calls due to disturbing the peace. Laying all this on the marijuana vote just isn’t credible.I agree that the city should allow sales, and that will be settled in about a month. While the revenue will be an addition to the city, it will not be a major new revenue source that is going to solve financing problems. As far as the government “treading on the citizens”, that’s a bunch of right-wing claptrap. The citizens are the government. If yo’re being tread on, please post pictures of the boot marks on your back, and the person doing the stomping. I apologize for having failed to fully enlighten Hasso’s readers. I have learned over the years that all things are connected, some more intimately than others. But make no mistake. The Konopa-Kellum Co-Op exists and will continue to thrive as long as good people refuse to acknowledge the existence of evil in this world.